Is it safe for Formula 1 to return to Bahrain this weekend? That's the question the organisation was pondering for days last week before taking the plunge and going ahead. But it's the wrong question. The likelihood that anyone taking part in, or going to watch, the Formula 1 race will be in danger from protests by Bahrain's Shia majority is very, very small. The right question is: Should F1 be returning to Bahrain this weekend? That is a much more difficult one to answer. There is no doubt that many Bahrainis, and many of the 600,000 expatriates who live here, are excited about F1's return to this little island after its cancellation last year. Tourists will flock in from Saudi Arabia, Dubai and Kuwait. Lavish sums will be spent on hotels and in the restaurants and malls. Even the taxi drivers will be happy. Happiest of all will be King Hamad and his Sunni al-Khalifa clan who have ruled this island for more than 200 years. Much less happy are Bahrain's Shia majority. Not all of them of course, but for a lot of Bahrain's Shia population the return of F1 gives a symbolic stamp of approval to the al-Khalifa regime, a return to legitimacy after a year as a semi-outcast. Standing on a street corner in a poor Shia neighbourhood on Sunday I met a middle-aged doctor. "We don't want Formula 1 here," he told me. "They ignore our suffering through this show. It shows everyone that things here are peaceful, that everyone is happy. But the reality is not like that." The reality is that many in Bahrain's Shia community, which makes up roughly two-thirds of the population, are very unhappy. Every evening they gather in their thousands at one or more of the sprawling Shia villages that surround the capital, Manama. There is a set pattern to these events. The men are at the front, black-clad women and girls at the back. Volunteers carry an elaborate home-made sound system, loud speakers strung together on top of long poles. Then they begin to march, chanting slowly at first. As the tempo picks up so does the volume. The men begin to punch their fists in the air and beat their chests. "Down, down with King Hamad," they call. "We will never bow before this corrupt regime, we only bow before God." Sometimes the marches end peacefully. But increasingly there is violence. On Monday night I watched as several dozen young men came out of the village to confront the police. The men carried stones and molotov cocktails. Their fire-bomb throwing was half-hearted and ineffectual, but it was all the provocation the police needed. They stormed in on armoured jeeps firing volleys of tear gas, and flash bang grenades. Many were carrying pump action shotguns. In recent weeks there have been several deaths at these protests; some victims are overcome by tear gas, but others are shot at close range with tear gas grenades or shotgun rounds. All we want is equality and freedom to choose our own government. Two weeks ago a young Shia cameraman was shot dead by gunmen who fired from an unmarked car. No-one has been arrested. Pro-government vigilantes are suspected - that too is something new. The anger of the Shia community is, at its root, economic. They believe they are discriminated against in jobs and housing. Their villages are tatty and unkempt. Many young Shia are unemployed. This in a country where more than half the population are expatriates. But the demands are now as much political as economic. "All we want is equality and freedom to choose our own government," a young woman tells me, her face framed by a black headscarf. "But if you call for an the end to royal rule, for a really democratic government, they will try to kill you." That claim seems rather extreme, until you look at the case of Abdul Hadi al-Khawaja. Mr Khawaja is currently in prison, 70 days into a hunger strike and close to death. He was arrested and put on trial last year for his part in the pro-democracy demonstrations that swept the country. A military tribunal sentenced Mr Khawaja to life in prison for inciting the violent overthrow of the al-Khalifa monarchy. While in prison, Mr Khawaja was beaten so badly his jaw was broken in three places. At a modest flat on the outskirts of Manama I went to see Mr Khawaja's wife and his daughter, Zeinab. They had just got back from visiting him in hospital. "His body is like a skeleton covered in skin," Zeinab tells me. "It is really hard for me to see him like this." For half an hour she talks passionately about her father's devotion to human rights, his belief in democracy, and most importantly his dedication to peaceful struggle. "My father's role models are Gandhi and Nelson Mandela," she tells me. "He tells people peaceful resistance is the only way. violence will not work." I tell her that the government says her father is an extremist, that if he has his way Bahrain will be like Iran, a theocracy run by Mullahs. She throws back head and laughs. "My father is not a mullah," she says. "And if he wanted a theocracy do you think I would look like this!" She is wearing jeans and a sweater, her delicately made-up face framed by a blue cashmere headscarf. In fact, the Bahrain government has failed to produce any evidence to support its claim that Mr Khawaja supports the violent overthrow of the monarchy. Amnesty International has declared him a prisoner of conscience. Denmark, where he also holds citizenship, is pushing for his release. But the Bahraini government is standing firm. "His case will be decided by the courts," Bahrain's justice minister Sheikh Khaled al-Khalifa tells me. "His case is being heard on 23 April." I suggest that he may be dead by then. "Well, we hope that won't happen," he says. "He is getting the best medical care. But this is not an issue of human rights, this is a serious criminal case that involves the survival of this country." 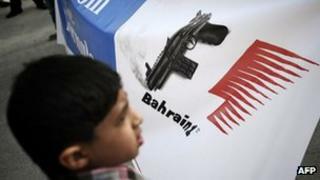 Amnesty International says the al-Khalifa regime has failed to live up to its promises to reform. Those responsible for killing and torturing protesters during last year's democracy protests have not been held to account, they say, and many prisoners of conscience remain in detention, despite a commitment to release them. The opposition to the Bahraini ruling clan is divided. The older generation still wants dialogue and new parliamentary elections. But the young Bahraini Shias who take to the streets every night are tired of waiting. They want change now, and they want King Hamad and his al-Khalifa clan to go.